This is a true Fair Isle beanie. It has the look and feel of a piece right out of the highlands. Knit with wool yarn, the Fair Isle makes it very thick. It is perfect for any cold winter day. The flowing 2 color pattern is intricate and interesting to look at. It is the perfect edition to any winter coat! 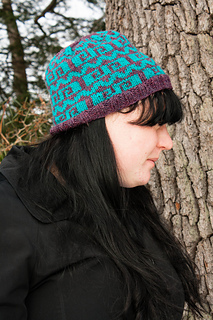 This hat is knit in the round with a traditional Fair Isle pattern. 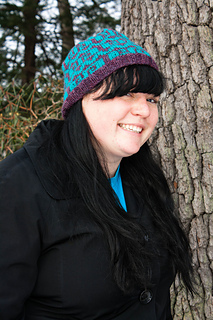 The knitter has a choice of creating a snug fitting beanie or a beanie that slouches. No matter the type of beanie the knitter chooses to make, the garment will provide warmth and fold to fit easily in a coat pocket.